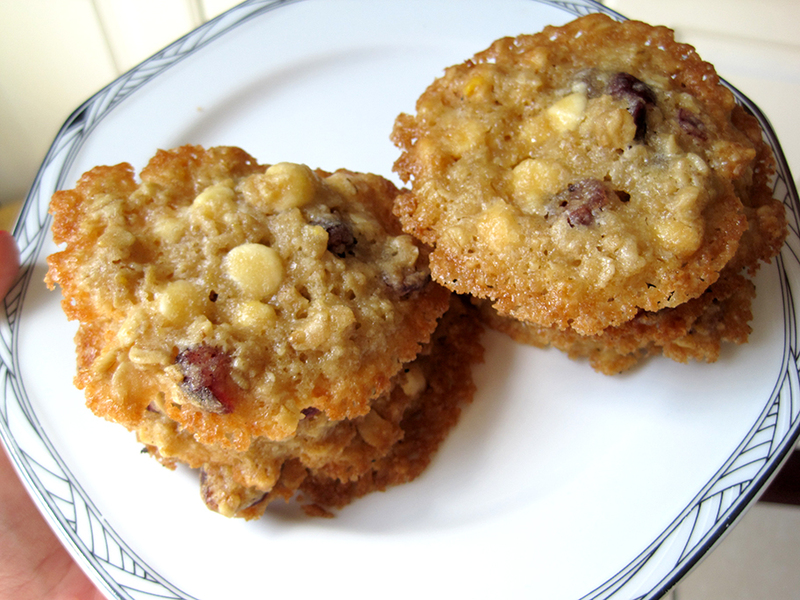 These are the second oatmeal cranberry white chocolate cookie recipe on this blog, the first being a Cooks’ Illustrated version I posted five years ago. Wow, has it really been that long? Anyhow, the cranberry-white chocolate flavor combination is very fall/winter, but it finally feels legitimately like spring in New York – I think my cookies must have chased the cold away. These cookies weren’t quite what I was hoping them to be. They turned out a little flat, but they did have crisp edges and a chewy centre as promised by the recipe. It’ll serve to please both crisp and chewy cookie-lovers alike. The caramelized flavor is strong on the edges, but tempers out when you encounter wholesome rolled oats and tart cranberries in the middle. In a small bowl, combine oats and water; set aside. In a medium bowl, whisk together flour, baking soda, salt; set aside. In a large saucepan, melt butter over medium heat. As soon as it’s melted, remove from heat and stir in sugar and brown sugar. Add egg, stirring quickly until incorporated. Add flour mixture to the pan and stir to combine. 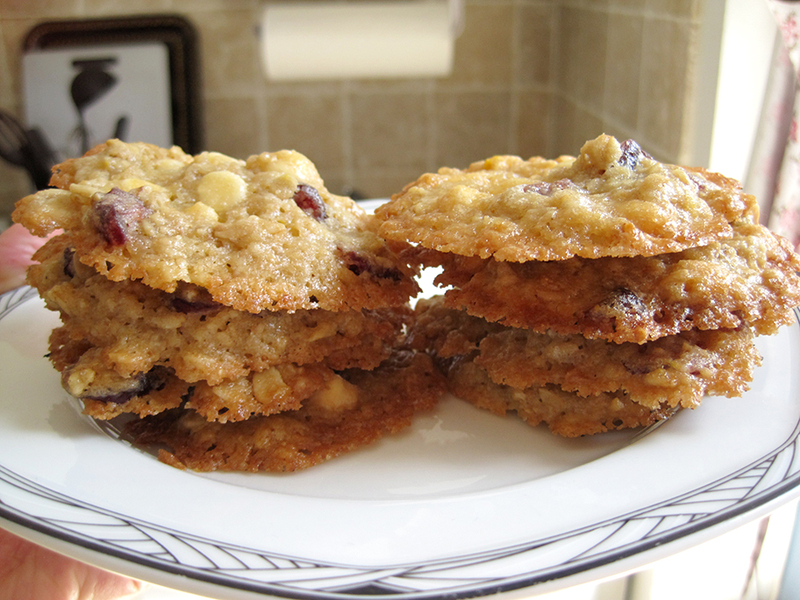 Stir in oats, cranberries, and white chocolate. Cover dough with plastic wrap and put in freezer for at least 2 hours. Adjust oven rack to lower and upper middle positions and preheat oven to 350°F. Drop cookies by the rounded tablespoon (I did 20-22 grams) onto prepared cookie sheets and bake until brown on top, 13 to 15 minutes. Let cool completely before moving.